Thomas Kevin Huddleston, 65, died peacefully on June 1, 2017, at the Androscoggin Hospice House in Auburn, Maine. Tom was born on April 3, 1952, in Daytona Beach, Fla.
Tom attended school in San Jose, Calif., then joined the U.S. Army in 1970, where he served his country until 1973, receiving an honorable discharge. Tom and his wife Debbie met on a blind date, and were happily married for 30 years. Tom was a devoted father to his daughters, Justina and Jillian. He dressed up for tea parties, taught master classes in catching fly balls, and showed them that a sense of humor can get you through almost anything. 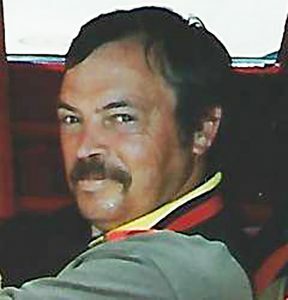 Tom worked as a driver for R.M. Packer Co. on Martha’s Vineyard, where he made a whole island of friends. He was notorious for putting a smile on the faces of coworkers and clients alike. He was a devoted NASCAR fan. If you knew Tom, you loved him. In 2000, the family moved to Farmington, Maine. He worked for Hammond Lumber for 15 years, until retiring early due to health complications. He was truly a unique person, a committed husband, a wonderful and caring father, a silly and loving grandfather, and a good-humored and loyal friend. Tom is survived by his wife, Debbie, of Farmington, Maine; his daughters, Justina of Van Nuys, Calif., and Jillian of Farmington, Maine; his adored granddaughter, Isabella of Farmington, Maine; and his sister, Kelly Dee of Hamilton, Canada. He was predeceased by his mother, Helen Groux. Donations in Tom’s memory may be made to the Androscoggin Home Care and Hospice, 15 Strawberry Ave., Lewiston, Maine 04240, or to a local hospice program of your choice. Hospice care kept Tom comfortable and treated him with dignity. Ever a humble man, Tom did not want a funeral. He will be laid to rest in the Tisbury Cemetery on Martha’s Vineyard, where his heart always remained. In his honor, the family asks that the next time someone asks you how you are, answer with “On top of the world!” Tom would like that. Arrangements are under the care and direction of Dan and Scott’s Cremation and Funeral Service, 488 Farmington Falls Road, Farmington, Maine 04938.